exida offers services, tools, and training to help organizations achieve safe operations, meet regulatory requirements, and deliver results. Ensuring that operations are safe, equipment is available, and operational goals are met is exida’s mission. We work closely with our customers to achieve high-impact, cost-effective solutions for their Alarm Management, Cybersecurity, and Functional Safety needs. As experts in safety, availability, and security, we bring a valuable perspective to the problems they are facing. Clients rely on exida to provide deep technical expertise, which assures correct solutions to even the most challenging problem. As important to getting the answer is having the insight to implement it in the optimal way—one that is affordable and sustainable. By combining expertise and insight, exida will help you chart the right course and stay on track to meet your goals. Our unique perspective enables us to offer the groundbreaking 3D Gap Analysis: a comprehensive review of functional safety, alarm management, and cybersecurity lifecycle implementation within your organization or plant. We also provide a complete offering of lifecycle services, IEC 61508 and IEC 62443 certifications, as well as the market-leading exSILentia software suite. exida has created a 3D Gap AnalysisSM assessment to efficiently evaluate how your organization complies with the Functional Safety, Cybersecurity, and Alarm Management (IEC 61511, IEC 62443, and IEC 62682/ISA-18.2 respectively). exida’s Lifecycle Services support many different industries. 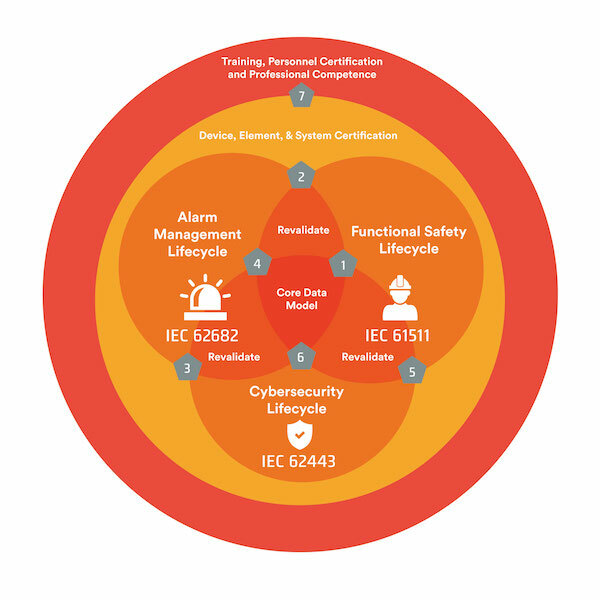 Though the approaches to functional safety, cybersecurity and alarm management may be different per industry, the overall concepts remain consistent. The IEC 61508 functional safety standard for example applies to all industries and allows development of industry specific standards. As a result, we see IEC 61511 for the process industry, IEC 62061 for the machinery and discrete manufacturing industry, IEC 61513 for the nuclear industry, ISO 26262 for the automotive industry and many more. As active members of many of these industry sector specific standard committees, exida has been on the forefront of implementing the standards in a variety of industries. With expert consultants in areas ranging from semiconductors and autonomous driving to industrial burner management systems, exida is active in all these industries providing in house and on project support.